I’m not sure how useful the waterproof feature of this thermometer is but if you are of the type to constantly drop your thermometer into water or beer (oh ok, waterproof makes sense now), then this is the solution you were looking for. 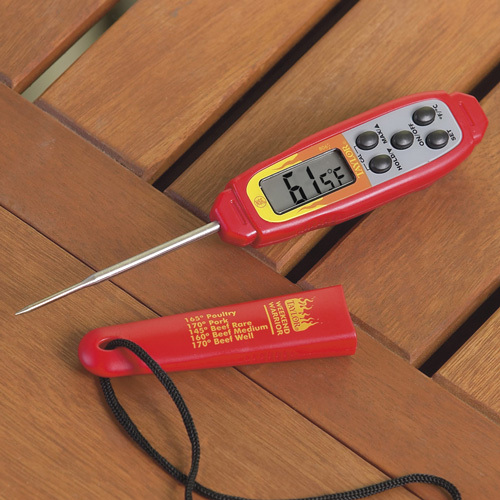 The Taylor Weekend Warrior Waterproof Digital Thermometer is an easy-to-use handheld device that helps you to ensure doneness in all of your cooking endeavors. The backlit LCD screen is viewable in low light and the three-inch stainless steel probe records temperatures from -40 to 450 degrees F. An auto-off timer and a minimum/maximum temperature memory complete the feature set that may be attractive to the beer drinking weekend warriors among us. This honestly is something I would use.